This is a self-study course which aims to change perceptions, heal minds and change behaviour. The work introduces miracles as naturally occuring expressions of love, and to experience miracles is to be aware of love's presence. Although Christian in language, the course is a perennial philosophy, presented in a way which is meaningful for present times. ;This edition is a combined volume containing the previous three volumes. - Publisher A Course in Miracles is a profound spiritual text focusing on the principles of universal love and forgiveness that has a revelatory impact on people of many faiths and religious backgrounds. Distributed since its initial publication by the non-profit Foundation for Inner Peace, and promoted solely through mail order and word of mouth, A Course' in Miracles has sold over 1,000,000 copies since 1975. Now Viking makes this book -- along with several companion books and products -- widely available to the trade. 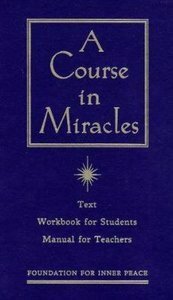 - Publisher A Course in Miracles is a classic in modern spirituality. The landmark guide is in as much demand today as it was when it was first published in 1975. This updated text is split into three volumes which include the text, workbook for students and manual for teachers. Although the course is Christian in statement, it deals with universal spiritual themes, and is designed to help achieve dramatic, lasting results in every aspect of your life. About "A Course in Miracles (2nd Edition)"
A Course in Miracles is a profound spiritual text focusing on the principles of universal love and forgiveness that has a revelatory impact on people of many faiths and religious backgrounds. Distributed since its initial publication by the non-profit Foundation for Inner Peace, and promoted solely through mail order and word of mouth, A Course' in Miracles has sold over 1,000,000 copies since 1975. Now Viking makes this book -- along with several companion books and products -- widely available to the trade.